Orchard irrigation. Photo by Jack Kelley Clark, UC IPM Program. The effects of drought stress on agricultural crop productivity have been studied for decades. Plant water status is a function of water availability in the soil, water transport, water use throughout the plant, and atmospheric evaporative demand. In the absence of a reliable plant-based tool to measure water stress, irrigation was historically scheduled using estimates of soil water availability and/or crop evapotranspiration. 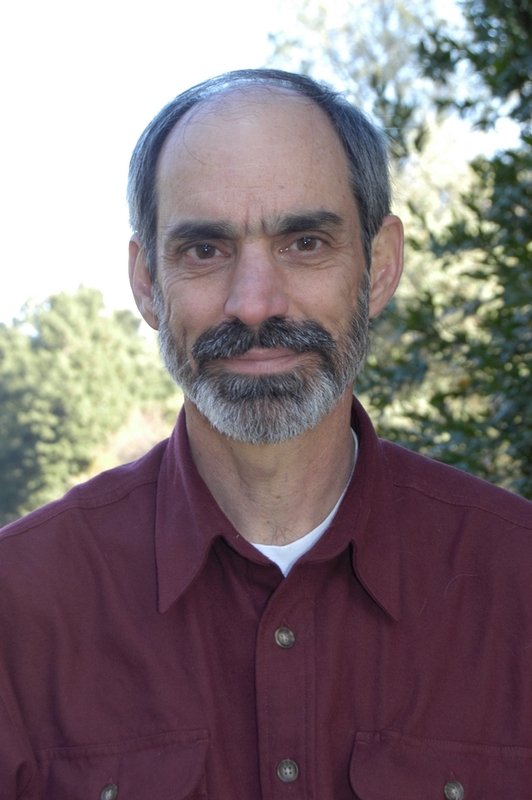 Dr. Shackel’s research established stem water potential as an accurate and reliable measure of water stress in prune (McCutchan and Shackel 1992). Later, a team of UC researchers lead by Dr. Shackel, including UC Cooperative Extension Farm Advisors, Extension Specialists and graduate students, improved the methodology for measuring SWP (Fulton et al 2001), and developed diagnostic thresholds linking SWP to levels of stress in almonds, walnuts and prunes (Shackel et al 1997 and 2000). 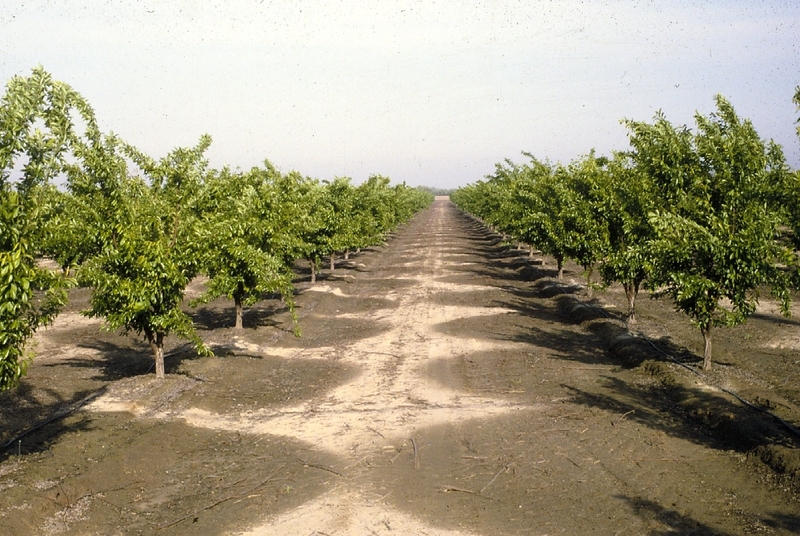 The Fruit and Nut Research and Information Center collaborated with Dr. Shackel and Charlie Turner (Academic Technology Services, UC Davis) to create a new “Irrigation Scheduling Using Stem Water Potential Measurements” website. Our new website calculates reference water potential for almond, walnut, prune, and grape crops using weather data obtained from nearby CIMIS weather stations and reference water potential models (Shackel et al 1997 and 2000). The home page includes an interactive google map enabling users to select the closest CIMIS station, or the station in the most similar microclimate. We also include pages with background information on tree water use physiology, and a chart outlining the physical symptoms associated with a range of stem water potential measurements in prune, almond, and walnut. Shackel, K.A., H. Ahmadi,W. Biasi, R. Buchner, D. Goldhamer, S. Gurusinghe, J. Hasey, D. Kester, B. Krueger, B. Lampinen, G. McGourty, W. Micke, E. Mitcham, B. Olson, K. Pelletrau, H. Philips, D. Ramos, L. Schwankl, S. Sibbett, R. Snyder, S. Southwick, M. Stevenson, M. Thorpe, S. Weinbaum, and J. Yeager. 1997. Plant water status as an index of irrigation need in deciduous fruit trees. HortTechnology 7:23–29. Shackel, K., B. Lampinen, S. Sibbett, and W. Olson. 2000. The relation of midday stem water potential to the growth and physiology of fruit trees under water limited conditions. Acta Hort. 537:425–430. Fulton, A., R. Buchner, B. Olson, L. Schwankl, C. Giles, N. Bertagnia, J. Walton, and K. Shackel. 2001. Rapid equilibration of leaf and stem water potential under field conditions in almonds, walnuts and prunes. HortTechnology 11:609–615. The Fruit and Nut Research and Information Center (FNRIC) is excited to announce the new pomegranate section of our website. Pomegranate cultivation has surged over the past decade in California. The industry has grown rapidly from 4,800 acres harvested in 2001 to 28,000 acres harvested in 2011 (NASS 2013). University of California Farm Advisors and Extension Specialists have been working hard to meet the demand for information about successful cultivation of pomegranate in California’s unique climate and soils, including several growers meetings and a new Pomegranate Program website hosted by the Fresno County Cooperative Extension office. The extensive new pomegranate pages on our site were written by FNRIC staff and reviewed by experts in UC Cooperative Extension and the USDA Germplasm Repository. Photographs of the Parfianka cultivar courtesy of Jeff Moersfelder at the USDA National Clonal Germplasm Repository. 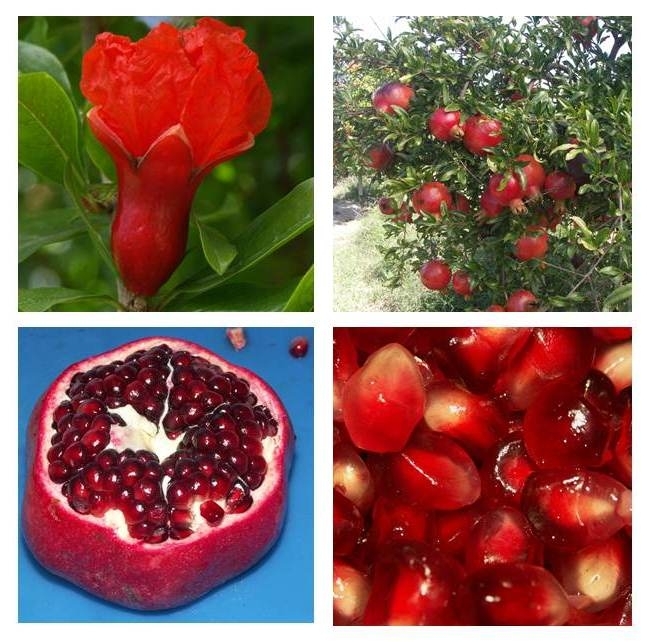 Images of a wide range of pomegranate cultivars are available on our new site. 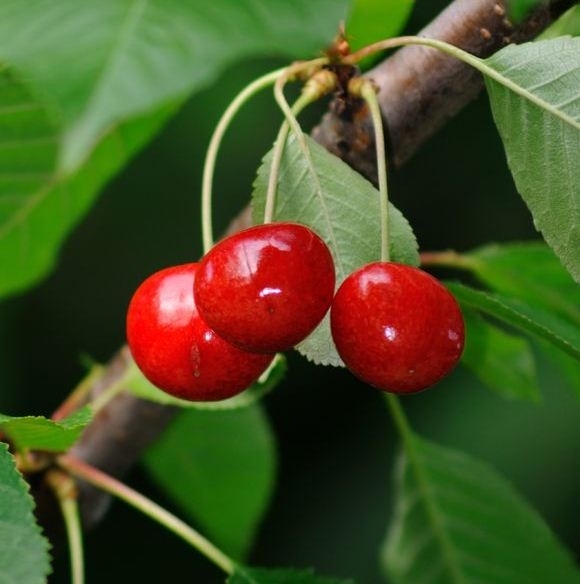 I am excited to announce a new peer–reviewed section of our website focused on sweet cherry production in California. Sweet cherry was originally introduced into the United States in 1629, and production has been well established in California since the 1800s. Today, California produces 68,000 tons of sweet cherries at a market value of almost 200 million dollars (USDA 2012). Dr. Ted DeJong and 2013 pomology extension course participants during pruning workshop. 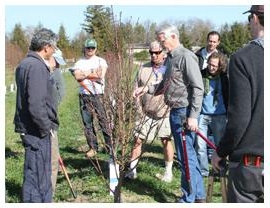 The FNRIC is hosting our 2nd annual fruit and nut tree extension course in February 2014, taught by UC faculty and specialists. We were awarded funding for four scholarships and are currently accepting applications from California growers. If you meet one of the following criteria please apply. Link to online scholarship application. Link to course webpages for more information. Applications are due October 1st. The FNRIC advisory board, composed of UC faculty, extension specialists, and farm advisors, will meet to select scholarship recipients soon after the deadline. If you have questions please contact Brooke Jacobs (bsjacobs@ucdavis.edu, 530-754-9708). The UC Fruit & Nut Research & Information Center (FNRIC) website, http://fruitsandnuts.ucdavis.edu, has been around for about twenty years and in that time, gone through several formatting updates and expansions. The website provides information about our short courses, access to the weather models, pages of content relating to over 30 crops, and links to farm advisor newsletters and other sources. It is a challenge to organize this diversity of information and provide intuitive pathways for our visitors to navigate the website. Tucked under the link titled Online Research Databases is a history, spanning several decades, of the research conducted by UC faculty, Specialists and Farm Advisors for the following specific crops: walnut, stone fruit, dried plum. This history is in the form of annual research reports provided by investigators to the respective commodity boards. The detail goes deep and browsing is not for the faint-hearted. However, each database is a testament to the dedication, expertise and cooperative efforts of UC researchers and, we hope, a primary source for current and future research teams and crop managers. Walnut was our initial database, and its creation was a cooperative effort among FNRIC staff, the California Walnut Board, UC ANR Communications, and programmer Jerry Schmierer, Colusa County Farm Advisor (now Emeritus). Subsequent databases (dried plum and stone fruit) were created using the UC ANR Repository. The advantage of using this system is that the UC ANR technical staff maintains and updates the database program and the server, assuring compatibility with future browser configurations and ADA compliance. As we look decades into the future, this division-level support will ensure that the databases remain accessible. We believe that the UC ANR Repository database has the long-term advantage over any other database application. For this reason, we ‘copied' the walnut database into the Repository in 2014. Before doing so, we added headers, footers and ocr-recognition to each file. So how big are these databases? Don't make me count, but walnut is about 1400 files, dating from 1973; dried plum is about 900, dating from 1961; and stone fruit is 365 files, dating from 1980- 2011. Some of the early years are incomplete. It would make the day here at the FNRIC if someone contacted us with a trove of these older, missing reports!